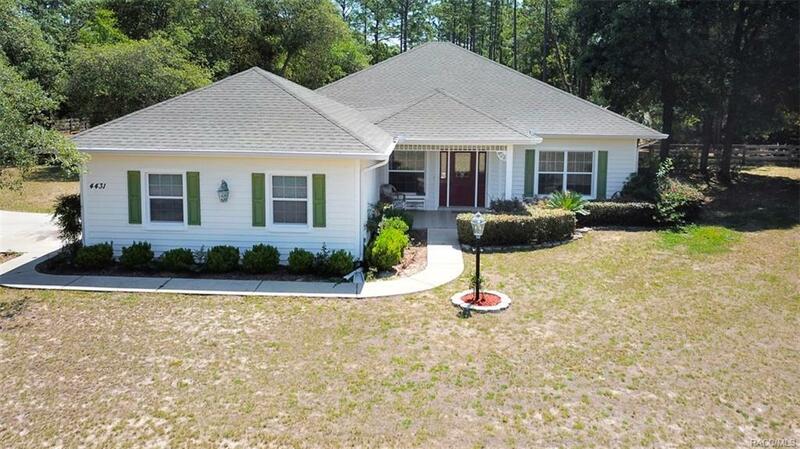 This Charming Country Style home has 2 Beautiful Large Master Suites and a Great Open floor plan. Features include a Newly Remodeled kitchen with all new Stainless Steel appliances, Oven Bake and Convection oven with child locks. Stone Leatherette Counter top and new "no touch" state of the Art Delta Faucet. 2 USB ports charging station built right in for your convenience. As you walk in through the front door the Great Room has Gas Thermostat controlled fireplace with 2 custom built ins. Relax on this property with your beautiful Private pool that was just acid washed and new pump. Large lanai for entertaining with fully fenced back yard for any pets or children. Brand new 2018 Carrier A/C unit! Please note this house is Fully Handicap accessible and Master bath/shower has all grab bar. A Must See!! Directions: Lecanto Hwy To Mustang Blvd. Right On Elkcam. House On Right. Kitchen: 12x9 Recently Remodeled kitchen with all new appliances, new large sink and Delta touch faucett. Stone Leatherette counter tops. pull out draws in cabinets, bread draw. 2 USB outlets in kitchen.